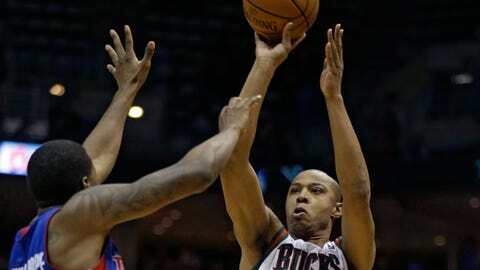 Milwaukee's Caron Butler played 32 minutes against the Pistons, his most playing time since Dec. 21. He rewarded the Bucks' coaching staff's faith in him by scoring 30 points. MILWAUKEE — Just two days removed from a root canal, Caron Butler almost didn’t play on his bobblehead night. For the Milwaukee Bucks, it’s a good thing he did. On the night the announced crowd of 11,266 at the BMO Harris Bradley Center received a bobblehead of his likeness, Butler scored 30 points off the bench to help the Bucks snap their nine-game losing streak with a 104-101 victory over Detroit. "It was a special night," Butler said. "It was bobblehead night, and obviously I’m well rested. I’ve been chilling on the sideline for awhile. I was excited to get back out there and just play. The coaching staff and my teammates believed in me and got me open and got me into a rhythm." Rumors whether Butler would even be available Wednesday swirled pregame, but the veteran gave it a go with O.J. Mayo and Larry Sanders already out with an illness. Butler ended up playing 32 minutes against the Pistons, his most playing time since Dec. 21. "It’s my second cavity in my life," Butler said. "I wasn’t feeling good yesterday and felt extremely weak. Coach just walked through the practice. He believed in me and gave me an opportunity tonight. That’s why it’s even more special." The Bucks, who hadn’t won since New Year’s Eve, came out with good energy and were able to sustain it throughout the game, even when Detroit made a few runs. Down 13 points with 5:39 left in the third quarter, the Bucks used a 26-13 run to tie the game early in the fourth. Butler scored 10 points in the stretch, including back-to-back 3-pointers to end the third quarter. "He was absolutely phenomenal tonight," Bucks coach Larry Drew said. "He shot the ball extremely well, and did a lot of other things. I think we can look at the stat sheet and see his production offensively, as far as shooting the ball. He also had seven boards and five assists. He played a very solid and complete game on both ends of the floor. "He came in and gave us a huge lift as far as making shots. He provided that leaership that we certainly need, given what our situation is." Butler’s homecoming hasn’t been what he has expected, both in terms of his team’s performance and how much he’s been used individually. He had played just 15.6 minutes per game in January and recently expressed frustration about his role. All of that was forgotten for a couple of hours Wednesday night, as Butler looked like the All-Star version of himself for the second time this season, the first coming when he scored 38 points on Nov. 22 in Philadelphia. "I understand the process," Butler said. "It’s frustrating at times. I’m human so I’m going to be honest with you, but at the same time, I see the big picture. I see we have some unbelievable talent. You want those guys to play. They have been doing a good job. But you want to be out there to help your little brothers get over the hump. Tonight was a special night to do that." However, scoring 30 points didn’t completely cure the side effects of the root canal. Butler was spent after the game, saying he was going to go right to bed when he got home. But at least the homecoming felt good, even if it was for one night. "This is a special day for me," Butler said. "A lot of loved ones, a lot of people in the community came out and supported me and the team tonight. It was a special night, so you want to put on a show." Jennings returns again: It was not quite as noticeable as his first trip back to Milwaukee, but Brandon Jennings heard boos almost every time he touched the ball Wednesday. Jennings was on his way to being the story with 28 points through three quarters, but the former Bucks guard scored just two points and missed all four of his field-goal attempts in the fourth quarter. 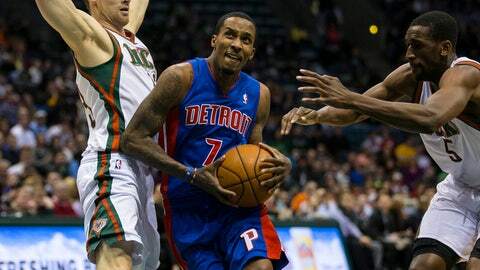 It’s been another up and down season for Jennings, something Bucks fans were accustomed to. Jennings leads the Pistons in scoring at 16.0 points per game to go along with 8.3 assists, but he’s shooting a career-low 36.9 percent from the field and 33.5 percent on 3-pointers. "He is learning the point guard position the way I like it to be played," Pistons coach Maurice Cheeks said. "He is learning, but he is a willing learner. He tries to be a sponge about the game, and that’s a good thing. When you go through some struggles and you are a willing learner, that means you are going to come out of (struggles) soon." Out sick: After missing practice Tuesday, Bucks guard O.J. Mayo and center Larry Sanders were unable to play against Detroit due to illnesses. Drew said Sanders was diagnosed with a cold, while Mayo was suffering from flu-like symptoms.